In this post, which draws on our recent New York Fed staff report, we deepen the puzzle further. all of the excess return occurs in a series of 24-hour periods eight times a year. Take away those 24-hour periods, and stock market returns are about what you’d expect them to be. So what are these 24-hour periods? They’re the periods from noon the day before Federal Reserve announcements until 2:15 on the day of the announcement. During those periods, stocks rise an average of about 50 basis points. That’s the red line in the chart on the right. During every other three-day period, stocks do nothing on average. That’s the black line at the bottom of the chart. What does this mean in aggregate? Since 1994, the S&P 500 has risen from about 400 to 1300. 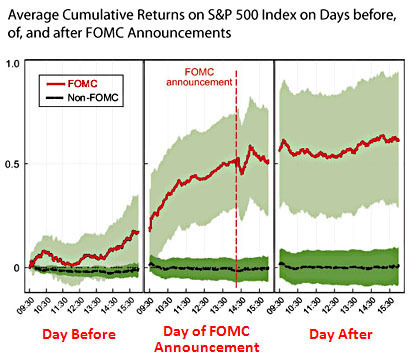 If you remove the three-day periods surrounding FOMC announcements, it’s barely risen at all. Does this mean that FOMC announcements are being leaked? Probably not. If that were the case, stocks would go both up and down, depending on the news, and then they’d regain their old level after the leak-receivers had taken their profits. But that’s not what happens. Stocks go up, and only up, and then they stay up. What’s more, the authors report that this effect occurs only for stocks, not for any other kinds of assets. So this is just plain weird, and the authors have no explanation. For some reason, the mere expectation of Fed news drives traders into a bullish frenzy. But not for long. If this effect is for real, I assume it will be arbitraged away instantly by people with much faster computers than you and me. There’s no easy money to be made here for us retail schmoes.